The biennial Wendy Evans Joseph Lecture on Art and Architecture presents artists whose work is inspired by the built environment. 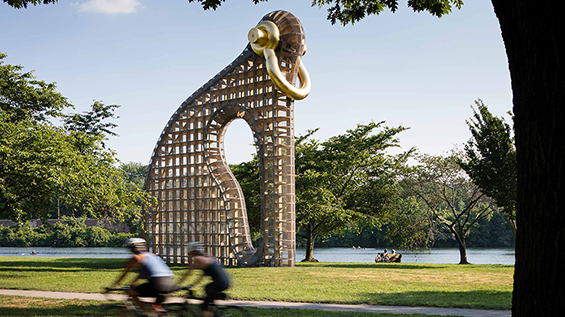 On June 27, sculptor Martin Puryear will discuss his work with Architectural League president Billie Tsien. An audience question-and-answer session will follow. One of the nation's most celebrated contemporary artists, Puryear is known for his devotion to craft and thoughtful exploration of history and culture. Raised in Washington, DC, he graduated from Catholic University in 1963. After spending two years in Sierra Leone with the Peace Corps, Puryear studied at the Swedish Royal Academy of Art, then earned an MFA at Yale. He later taught in Nashville, Maryland, and Chicago and earned a Guggenheim fellowship to study architecture and garden design in Japan. His many accolades include a MacArthur Foundation fellowship, a Gold Medal in Sculpture form the American Academy of Arts and Letters, and a National Medal of Arts. Major retrospectives of his work have been mounted at MoMA, the Art Institute of Chicago, and other institutions. This lecture is co-sponsored with The Architectural League of New York. Tickets are free for Cooper Union students and faculty with valid ID, and League members. For ticket inquiries, please refer to The Architectural League of New York website. Video documentation thanks to The Architectural League of New York.